A Bar Mitzvah is a coming-of-age celebration for a 13-year-old Jewish boy. It signals his transition into adulthood, when he becomes obligated to observe the commandments of Judaism. Traditionally, guests and family were expected to dress in a reserved manner to mark the importance and seriousness of the event. In recent years, however, the dress code has become more festive but still respectful of the event. 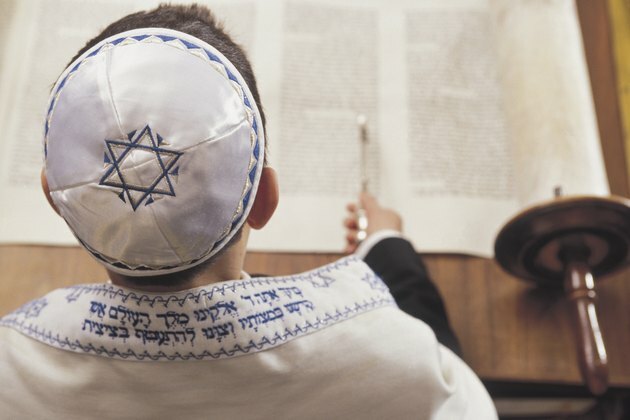 A traditional Bar Mitzvah is a semi-formal event marked by a service -- which usually takes place early in the day -- followed by a party or reception immediately afterward or later in the evening. Women should choose clothes similar to those they would wear to a Sunday church service. If you choose a fancy party dress for the reception, tone it down with a cardigan, shrug or shawl for the actual service. Men should wear a conservative suit in neutral or dark colors. While there are no set traditional colors for Bar Mitzvah dresses, black, brown, navy blue, burgundy and ivory are appropriate, as are other single-color dresses. Liven these colors with pops of brighter accessories, such as a hat, belt, shoes and gloves. Or opt for a brighter monochromatic outfit with matching accessories. Avoid dresses with large, bright patterns so you don't upstage the young man celebrating his big day. Dresses with small floral or geometric print are appropriate. The general consensus is to be festive but not garish. A sheath dress -- a straight-cut dress with or without sleeves -- is ideal for the transition from service to reception. Dressy pantsuits with beaded jackets or cardigans are also appropriate, as long as they are not too garish or sparkly. Wear a dress that is modest and does not show too much skin; this is a religious service despite the celebratory reception afterward. If you have what you think is the perfect dress but it's strapless, wear a silk scarf over your shoulders held in place with a brooch. Orthodox congregations are far more conservative and modest when it comes to women's attire, and requirements differ from congregation to congregation. The basic rules that apply discourage pantsuits and pants, as well as blouses or dresses that show cleavage. Skirts should be knee length or longer, and sleeves should extend past the elbow. Bare shoulders are a no-no; cover them with a shawl, jacket, scarf or sweater. Additionally, the theme of modesty harkens subdued dress colors overall.